Many people have attributed China’ s growth since 2001 to its accession to WTO and the resulting rapid export expansion. We provide quantitative evidence showing that internal economic reform, not export expansion, was the real driver of China’ s growth in the period after 2001. We also show that there is still large potential growth from further internal reform in China. China experienced rapid growth between 2000 and 2005. Many attribute this to the external trade liberalization associated with China’ s accession to the WTO in 2001 and the resulting rapid export expansion supported by cheap migrant workers. 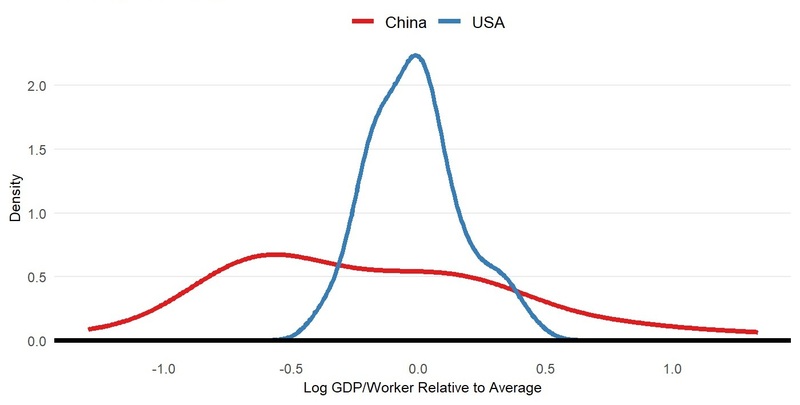 In a paper forthcoming in the American Economic Review, we argue that internal economic reform, not export expansion, was the real driver of China’ s growth in the period after it joined the WTO (Tombe and Zhu, 2019). In our analysis, we quantify how goods- and labor-market frictions affect aggregate productivity in China. We combine uniquely detailed data with a general equilibrium model consisting of internal and international trade and migration across regions and sectors. The combination of the model and data allows us to estimate the magnitude and consequences of trade and migration costs. We find both types of costs were high in 2000 but declined significantly afterward, with large impacts on China’ s post-2000 growth. 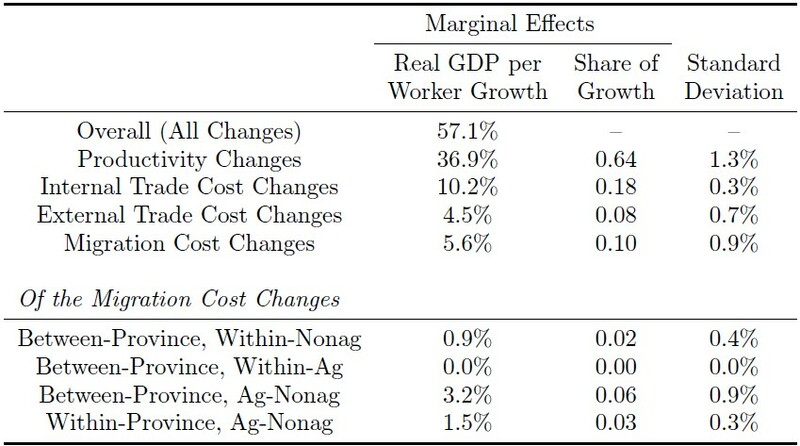 Our estimates suggest reductions in trade and migration costs led to around 20% aggregate labor productivity growth between 2000 and 2005, which accounts for more than one-third of the actual growth during the period. We also find that most of the productivity gains come from reductions in internal trade and migration costs rather than from reductions in external trade costs, contrary to the prevailing narrative of China as an export-led development story. To set the stage, we start with a brief discussion of two key facts about China’ s economy in 2000. First, there were very large regional income differences. For example, the ratio of the average real GDP per worker in the five provinces with the highest income to the average GDP per worker in the five provinces with the lowest income was 4:1. In general, the coastal provinces in the eastern region had substantially higher levels of real GDP per worker than provinces in the central and western regions. Note: The gray shaded regions are Tibet, Hong Kong, and Taiwan, and are excluded from the quantitative analysis. This dispersion is large. In comparison, as we plot below, the dispersion of GDP per worker across US states is significantly less. 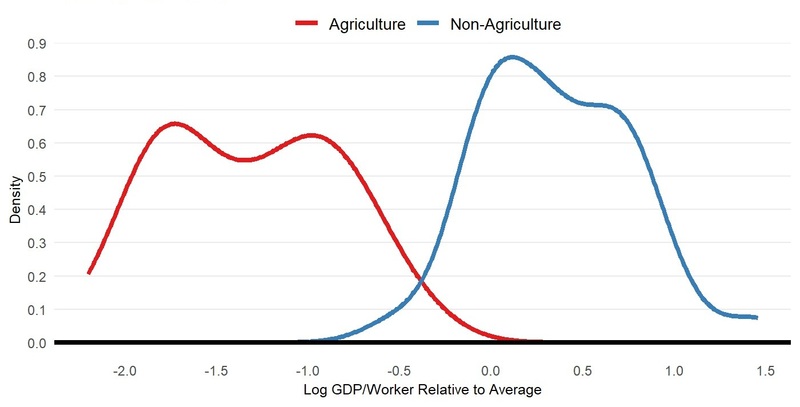 Second, in our plot below of the cross-province distribution of GDP per worker within China’ s agricultural and non-agricultural sectors, it is evident that there was a large dispersion of income within sectors and higher incomes in the non-agricultural sector. Even after controlling for price differences between rural and urban areas, the real GDP per worker in the non-agricultural sector was still much higher than that in the agricultural sector in all provinces; the average ratio of the real GDP per worker in the two sectors within a province was 4:1. The hukou system, which imposes severe restrictions on worker migration within China, is an important reason for the large real income differences across Chinese provinces and sectors. To appreciate the costs mi grants face under the hukou system, a brief review of its history may be helpful. In 1958, the Chinese government formally instituted a household registration system to control population mobility. Each Chinese citizen is assigned a hukou (registration status), classified as “agricultural (rural)” or “non-agricultural (urban)” in a specific location. Individuals need local government approvals to change their hukou category (agricultural or non-agricultural) or location, and it is extremely difficult to obtain such approvals. Before the economic reform started in 1978, working outside one’ s hukou location or category was prohibited. This prohibition was relaxed in the 1980s, but prior to 2003, workers without local hukou still had to apply for a temporary residence permit. Obtaining the permit was difficult, so many did not attempt it, and those who did risked arrest and deportation by local authorities. But as the demand for migrant workers in manufacturing, construction, and labor-intensive service industries increased, many provinces, especially the coastal provinces, eliminated the temporary residence permit requirement for migrant workers after 2003. This eased the costs of migrating. There was also a nationwide administrative reform in 2003 that greatly streamlined the process for obtaining a temporary residence permit in other provinces. These policy changes made it much easier for workers to leave their hukou location and work somewhere else. However, even with a temporary residence permit, migrant workers without local hukou still have very limited access to local public services and face much higher costs for health care and their children’ s education. Therefore, despite the reforms, the costs of being a migrant worker remain high, especially for out-of-province migrants and older workers for whom having access to public services is more important. We construct our own data on migration from China’ s population census in 2000 and 2005 and consider a migrant as one who lives outside their area of registration. We find the numbers of inter- and intra-provincial migrant workers have both increased significantly between 2000 and 2005 and that most of the increases are due to rural-to-urban migrants. By 2005, there were 49 million workers who moved across provincial boundaries and 120 million workers who switched sectors within a province. While migration of this magnitude is unprecedented, as a share of total employment, it is less impressive. Despite large income disparities across provinces, inter-provincial migrant workers accounted for only 4.2% of total employment in 2000 and 7.2% in 2005. 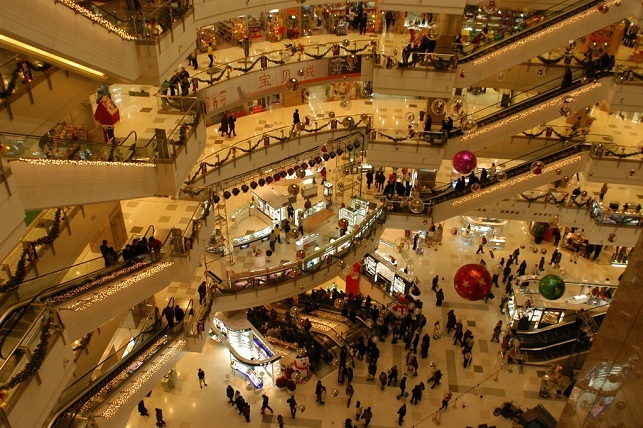 Turning to trade, China has experienced dramatic liberalization since the 1990s. China’ s international trade liberalization and WTO admittance are well known; its internal trade liberalization is not. 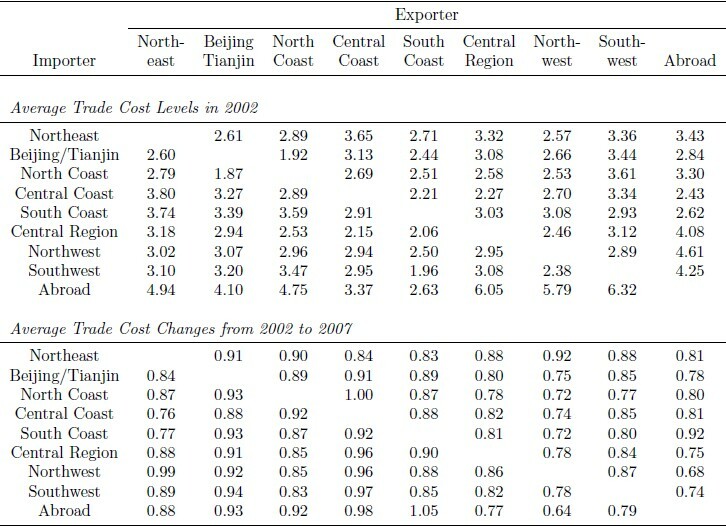 Several researchers have documented high internal trade costs in China in the 1990s (Young, 2000; Poncet, 2005). Others link local market protections to the size of a province’ s state sector (Bai et al., 2004). Since 2000, these internal trade barriers have fallen significantly. Some of the reduction was due to deliberate policy reforms and, more importantly, various SOE reforms. Improved transport infrastructure and logistics also helped lower internal trade costs. As a result, we estimate a region’ s share of spending allocated to imports from the rest of China increased by nearly 7 percentage points, while the share imported from abroad increased by only 1 percentage point. How large were these trade and migration cost reductions? Using the data and our quantitative model we estimate both the levels of and changes in trade and migration costs in China. We find that trade costs were large in 2002, but they declined significantly between 2002 and 2007. We display below the tariff-equivalent average trade cost levels and the relative change between eight broad regions of China, and between those regions and the world. On average, internal costs fell by 10–15%, and international costs fell by almost 10% in non-agriculture and nearly 25% in agriculture. For migration costs, the average cost of moving from rural to urban areas within a province in 2000 was equivalent to shrinking one’ s real income by a factor of nearly 3; between-province moves are an order of magnitude more costly. But between 2000 and 2005, however, migration costs declined substantially—by 18% on average, and by almost 40% for between-province moves. In the following table, we report various summary measures of migration costs. Each are reported in terms of by how much migration costs shrink the value of real income for workers. 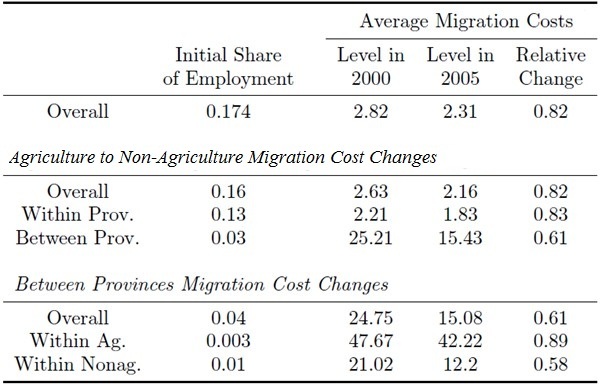 In 2000, we find migration costs average 2.8, but the costs are greatest for workers switching provinces. As discussed, these costs represent a number of factors, from administrative restrictions inherent in the hukou system of China to non-hukou costs such as the distance in the home region between where one works and where one’ s family lives. Restrictive land markets and collective ownership mean migrants lose benefits from land if they live outside their registration area. We find the loss of land income is equivalent to an average migration cost of 1.9. Combined with our direct measure of migration costs, the overall cost of migrating averaged around 5.3 in 2000, but declined significantly by 2005. What effect did the reductions in trade and migration costs have on China’ s aggregate productivity? To answer this question, we conduct a counterfactual analysis based on our two-sector multi-region general equilibrium model featuring internal trade, international trade, and worker migration. We also incorporate into the model collective ownership of land, an important institutional feature of China that makes migration difficult. Analyzing various counterfactual experiments in which we simulate the effect of these cost reductions, among other experiments, allows us to decompose China’ s overall growth. Reductions in trade and migration frictions account for more than one-third of China’ s overall growth. Reductions in internal trade and migration costs contribute roughly 28% (15.8% out of the 57.1%). In stark contrast, international trade cost reductions account for only 8% of the overall growth (4.5% out of the 57.1%). Most of the contribution from migration cost changes is due to the lower costs of switching from agricultural to non-agricultural sectors, in particular, for those also migrating across provinces. We report our full growth decomposition in the table below. Despite the decline, internal trade and migration costs are still high and there is room for further reform. Although we only report a subset of all our analysis here, three experiments are revealing. First, if internal trade costs fell to the level observed in Canada (a country for which comparable data and methods may be applied), we estimate China’ s real GDP and welfare would increase by a further 12.5% and 16.3%, respectively. If inter-provincial migration costs are reduced so that migration flows increase to a level similar to the United States, where roughly one in three residents live outside their state of birth, real GDP would increase by a similar magnitude and welfare by even more. Our quantitative analysis demonstrates the contribution of export expansion to China’ s growth is quite limited. In contrast, the reform that reduced internal trade and migration costs was an important driver of China’ s growth after it joined the WTO. Further internal reform can be an important driver for future growth, especially in the worsening environment of international trade. 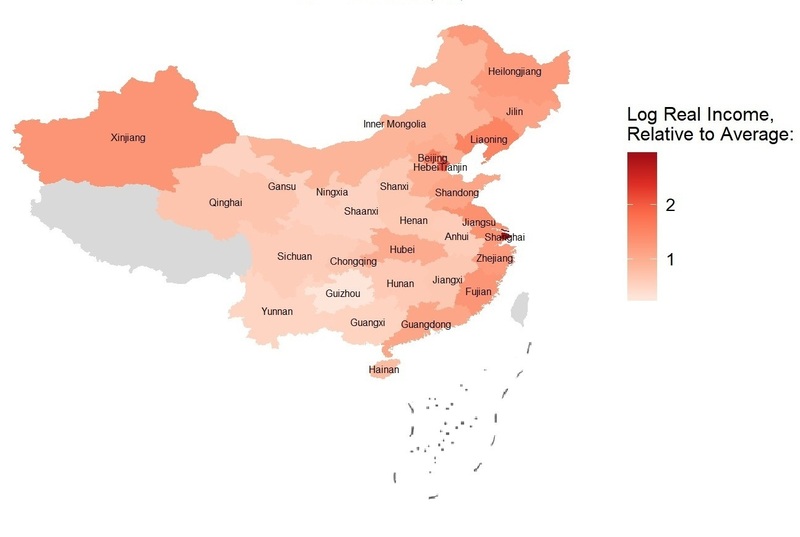 The continued investment in transportation infrastructure, the rapid development of e-commerce, and the relaxation of hukou restrictions in some lower-tier Chinese cities in recent years may have further reduced internal trade and migration costs and therefore contributed positively to economic growth. However, the more stringent hukou policies recently adopted by the top-tier cities have significantly increased the costs for migrants to work in those cities, and most likely will have a negative effect on growth. Bai, Chong-En, Yingjuan Du, Zhigang Tao, and Sarah Y. Tong. 2004. “Local Protectionism and Regional Specialization: Evidence from China’ s Industries.” Journal of International Economics 63 (2): 397–417. Poncet, Sandra. 2005. “A Fragmented China: Measure and Determinants of Chinese Domestic Market Disintegration.” Review of International Economics 13 (3): 409–30. Young, Alwyn. 2000. “The Razor’ s Edge: Distortions and Incremental Reform in the People’ s Republic of China.” Quarterly Journal of Economics 115 (4): 1091–1135.